The movie is one of Tyrone Power's most popular of the 1950's, as well as one of the most popular movies that came out in 1956. The signature music for the movie is from Chopin's Nocturne in E-Flat Major, played beautifully by Carmen Cavallaro. The movie was Oscar nominated for the color cinematography, musical scoring, best writing in a motion picture story, and sound. Eddy Duchin's son, Peter, did become quite a popular pianist, too. 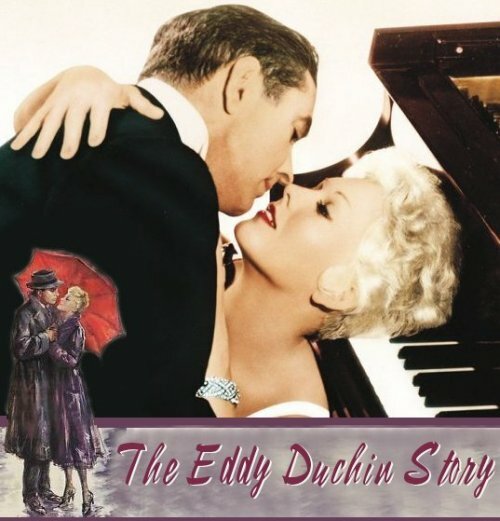 On Peter Duchin's Official Site is the comment about the movie, "The beautiful and tragic story of Peter's parents is wonderfully told in the 1956 movie, The Eddy Duchin Story, starring Tyrone Power and Kim Novak." Newsweek reviewed: "A good deal of Duchin's musical spirit is to be encountered in this movie, ostensibly based on his life. Tyrone Power plays Duchin and does not look utterly unlike him, while the piano is handled by Carmen Cavallaro whose style is similar to Eddy's, if flossier." The picture to the left is a photo of the real Eddy Duchin. 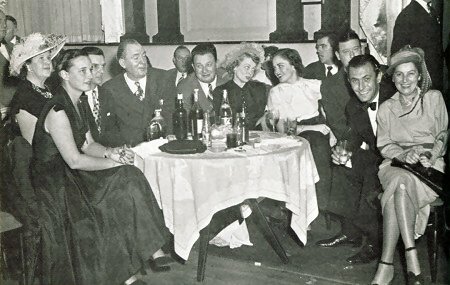 He is on the far right of the picture, and his wife, Chiquita, is on the far left. Belafonte, Dennis. Films of Tyrone Power. Secaucus, N.J.: The Citadel Press, 1979. Press Kit for "The Eddy Duchin Story"